Long Island startup KeyMe launches this week in five 7-Elevens across Manhattan, with a kiosk coming Friday to 351 Bowery (or “Bowery St.,” as the press release puts it). No 7-Eleven, the grassroots campaign against chain stores and corporate franchises, has been active in protesting against the evils of the Go-Go Taquito (and yes, the occasional evidence of a “modern-day plantation system”). 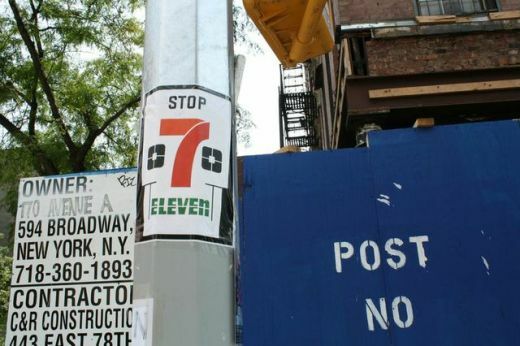 This past weekend the group hosted a “joyful-artistic-poetic-musical protest” against the expected opening of a 7-Eleven on Avenue A. But when the Slurpee-hating masses find themselves locked out of their beloved small businesses after a too-late night of slam poetry, with nowhere to turn, and not even a bottle-opener on hand to aid their woes – well, perhaps 7-Eleven won’t look like such a menace after all? « So Deck! Forget Vinyl, This Label Is Still Releasing Cassettes	» #MellowYeezus Got Bushwick on Buzzfeed, CitiBikes Coming to Greenpoint?